our family journey. following the bright and morning star. Dan calls it “low-stakes worrying.” I pick a problem to solve that isn’t actually a big problem, and work on solving it. It keeps my mind busy, and away from the big “what if” worries that you really can’t do anything about anyway. It is also a great way to wait for an appointment or stand in line. For years (I kid you not), it was baby names. 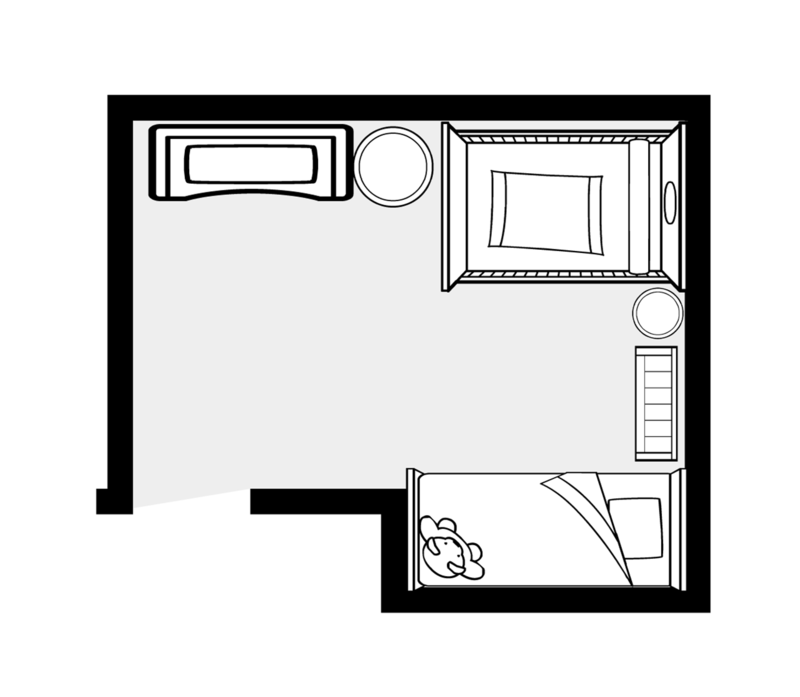 Lately I have been thinking of how we will make room for two kids in one of our kids’ bedrooms. It’s a bit complicated because we are not sure how old our child will be when he/she comes home (consider the different sleep needs of a 9 month old versus a 3 year old). We are also not exactly sure how big our “big kids” will be when their new sibling comes home. However, home-coming is not imminent… Therefore, it is the perfect “low-stakes worry.” We think that initially– regardless of our child’s age– he or she will sleep (in a crib/bed) in our room. We want to do whatever we can to bond with our child, letting her know we will be there if she needs anything. So being close together at night time makes sense to us. After we all settle in a bit, we think he or she will share a room with the same-gender sibling (if we have a girl, she will share with Aubrey, etc). A few years ago, Dan and I found this awesome online tool that allows you to rearrange a room without lifting a finger. It was super useful when we were shopping for new bedroom furniture and needed to know what would fit in our room, and how to make the best use of our space! Both the kids’ rooms are about the same shape, so we recently spent some time daydreaming about how we would set up a shared bedroom for a little kid and a big kid. I think it turned out cute! We included (clockwise) a dresser/changing table, big round toy basket, a crib/toddler bed, laundry basket, bookshelf/toy shelf, and a “big kid” bed (the Ikea “Sundvik“). It is important to me that there is still room to play, and I was happy to see there totally is! I’ve heard some people like to do crosswords, but I think rearranging furniture is good brain exercise too. p.s. I know about bunk-beds, but I am just not ready for that! You guys. Our friends have been trying for years to conceive, and in a whirlwind of God’s timing they decided to officially pursue adoption, complete their home study, and just weeks later they have a daughter!!! Adoption had always been a part of their plan, but the timing was a complete surprise. And now I am crying. Crying because I have two babies, and I know this kind of love… These friends—they are precious. They already love this little baby, and the best is yet to come. And then, one day, she is here. Your first little baby. Smaller than you thought, but bigger than your whole world. How could she have ever not existed? How have you ever spent a day not holding her close, smelling her sweet baby smell, watching her grow? And it hits you. You are surprised by love. There is nothing she has done to earn it. There is no way she could merit more, and yet it grows every day. There is nothing she could do to lose it, and its strength will really be proven in a year or two when she fights you all day, and you still.just.love.her. And you long for her love. You may not have a baby yet. I have many friends who are just longing. Waiting and longing. And already loving. They are not parents yet, but they already have parent love overflowing their hearts. They are learning about this unmerited, blind love in an aching way. And I pray with faith that it will bring so much fruit someday soon. This relentless love. And what is even more amazing than your love for your child—the only thing more amazing—is that this love, this good, good love we are growing into and learning and beginning to know… This love is like the love God has for us. The Psalms tell about God’s love for us when we were knitted together in our mother’s womb. He plans for us, pursues us, longs for us, and goes before us to show us the way to Him. He knows when we sit and when we rise. And wherever we go, He searches us and knows us. He forgives us, and He does not stop loving us. I am surprised by it every day. In small moments. After a lengthy at-the-top-of-his-lungs-on-the-floor tantrum (caused by me not stirring the pot the right way while cooking dinner), I just still love my little boy. And I wonder what God thinks when I am disappointed by my plans not going the way I wanted them to go. When they are amazed at the gift I give them, it makes me so happy, and I think of how God delights when we delight in His creation. I am surprised when I wake up for the 3rd time by 3 a.m. to comfort a teething baby, and I still love to cuddle him. And I thank God for the ways He comforts me. I am surprised by love when I have an overwhelming, exhausting, defeating day of parenting, and I then miss my children after I put them to bed. And I wonder if God has been missing me that day. When they ask “Why?” Why can’t they have that thing they want so much. When they do that thing—the thing we have warned them about that they know could hurt them, and then they are hurt. In those moments I am a parent, and I am just a child. Desperately loved by my Father; desperately needing His love. It is the best thing about parenting by far. It isn’t something special that I am doing or am particularly skilled at. It is just something God grows in us. Our love for our children is a glimpse of His love for us. And it is surprising me again. When we started earnestly discussing adoption, Dan and I both had honest fears. Fears about how adopting would affect our family, our children, our marriage. When we committed to adopt a child, we committed to loving our child no matter what. And over those years—since those very first conversations Dan and I had about whether we might ever consider adopting a child—God has been growing love in our hearts for a child. It’s hard to pinpoint the moment when my perspective changed from “adopting a child” to “bringing home my baby…” It just did. I have a longing. A love. I don’t even know how it started, or how big it will get. How strenuously it will be tested, or how long it will take to be returned. But I know it is there. Inexplicable. Impractical. Unexpected. I love a child I have not yet met. One of my babies isn’t home in my arms. I can’t even describe how unsettling that feeling is. But I will not stop loving you, Little One. No matter where you are, or how long it takes to bring you here. No matter what you do, or if you ever love me back. I already love you. I can’t wait to surprise you with our love. I have always been moved by music, and I often have a song or two on repeat for days or weeks or even months (sorry Dan!). Sometimes a particular song captures a theme in my life, or puts life to my feelings, or helps me start a dance party with the kids in the living room when my energy level is already in naptime. Anyway, I have been “stuck” on a few songs lately that have become really meaningful to our adoption story. Today I realized that each song represents a different stage of the adoption journey, essentially creating an adoption soundtrack, and I had to share. I hope you enjoy—and don’t worry—they are not all ballads. Dan and I truly believe adoption is beautiful. But adoption always begins with loss. A child loses his birth parents. He may lose siblings, extended family, friends, birth culture, and the feelings of belonging and identity that come with such a community. He may lose perceived “normalcy” and privacy if he is adopted by a family of a different race—because his family is conspicuous (anyone can see that he was not born into his family). And he may have to face each loss again in a new way as he grows and enters new life stages. An adoptive family may experience loss before they choose to adopt—parents may grieve the loss of children by miscarriage, or the loss of building a family the way they had always dreamed. Birth families endure the loss of a child, sometimes as the result of their own tremendously heroic choice to do what is best for the child. This song is one that I have turned to in times of my own heartache. But this song isn’t just about suffering; it moves me toward peace, trusting in God that “all now mysterious shall be bright at last.” Adoption isn’t just about loss– it is mostly about hope and love and new life! It is faith that even through the thorniest paths God can lead us to a joyful end. Oh yes, the wait… We are just at the beginning, so I can only imagine how some families feel years into their wait, especially if they have already met their child. But I totally agree with something I have heard from other families– “Once you finally commit to adoption, you have already thought about it and prayed for so long, you know you are ready. You are ready to bring your child home, but you are just beginning the process.” I like to blast this song and imagine my love and words crossing oceans and mountains, highways and dirt roads all the way to our little one… There may also be a bit of interpretive dance involved—Aubrey and Thatcher help me out with that. I also particularly like the lyrics “One step closer…” So true. And there will be complications. At one point, we realized the “final copy” of a very important document– which we were about to mail to some very important people– had the wrong name on it! As in, not our name! This hiccup cost us time to resolve (sent to our agency, sent for approval, sent back to us), but now we look back and thank God for that extra time! Without that silly mistake, we may have missed one of the most important moments of our adoption journey so far. We are starting to realize how very little control we have, and how that is actually a good thing! This song is definitely a boost in those crazy-frustrating-God-must-have-a-plan times. This is our greatest hope for our child. We pray that our child not only feels like she belongs in our family, but that she belongs in the love of God. That she was destined and longed for, that she is known, and cherished. That she has forever family in us, and eternal love in Jesus. What’s your anthem these days? I never realized what a “girly” girl I was until I had a daughter. 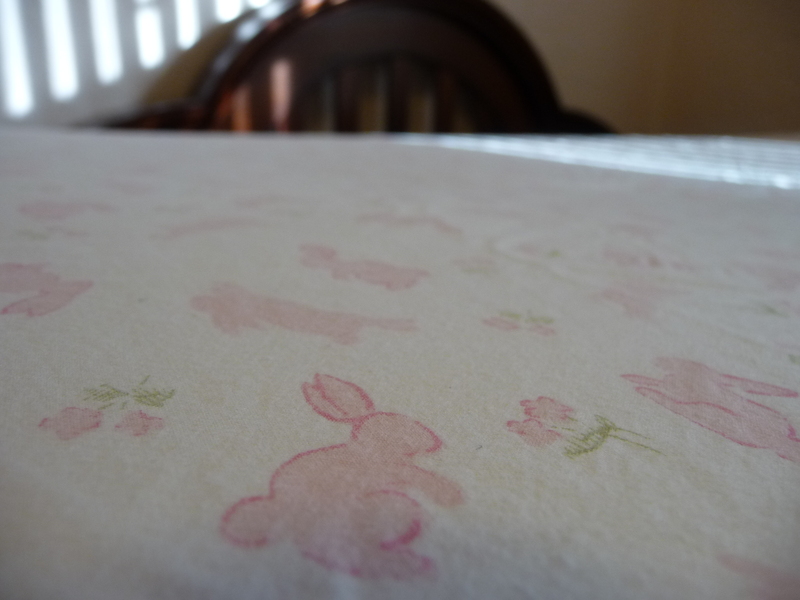 Ever since I found these pink bunny crib sheets when I was pregnant with Aubrey, it was game over. I knew pink and green would be the color palette for her nursery, and I embraced the soft, sparkly, sweet side. Now Aubrey is old enough to enjoy going to events, and we have been blessed the last few months with some special opportunities for Aubrey & Mommy dates. In early December, my friend surprised us with tickets to see the Cinderella Ballet. It was our first ballet ever, and Aubrey cried when it was over. Her consolation was that as we left we met many of the dancers, and she said “Great job!” to each one. In mid-December Aubrey and I went to a “Fancy Nancy Tea Party” at our local library. Fancy Nancy is a character from a series of children’s books (of the same name). Nancy loves dressing up and accessorizing (she also teaches the “fancy” way to say things as a fun way to build vocabulary). I like the term “fancy.” Aubrey used to dress up and say “I’m so beautiful!” Now we remind her that “she is beautiful no matter what she wears; dressing up just makes her feel fancy.” At the tea party: the librarian read a book, the children helped decide what things were fancy and what things were plain, then the children made crowns, and had hors d’oeuvres and pink-lemonade tea (pinkies up!). Getting fancy for the tea party- I wore Aubrey’s favorite skirt of mine (you can’t tell here, but it has lots of sequins!). 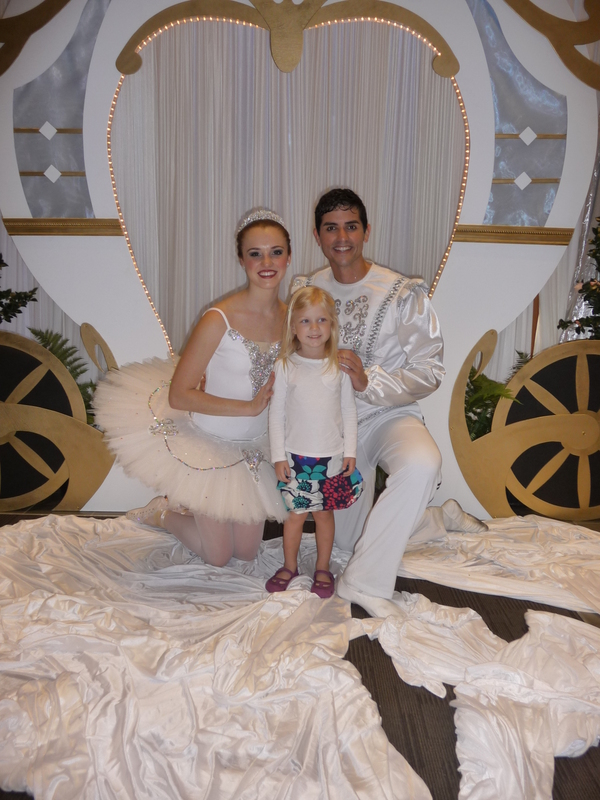 At the end of the month, Aubrey and I went to The Nutcracker Ballet. We read a Nutcracker book before the ballet so we would be able to follow along with the story during the performance. The Cinderella ballet was a local production, and the Nutcracker was done by a national ballet company, so I was interested in seeing the difference. I truly loved both ballets, but the Nutcracker had a better flow, and created a more cohesive and powerful story in less time. Part of the difference probably came from the fact that the Cinderella ballet was very long. I think every dancer in the company was featured– even if it meant they had to come up with 100 new roles; and on behalf of all their moms, I didn’t mind at all. So excited to see the Nutcracker!!! During the Nutcracker ballet I asked Aubrey what she thought and she said “I have two happy tears because it is so beautiful!” I love to experience new things with Aubrey because she is so unabashed with excitement and wonder, and I feel like I have permission to join her. After the holidays passed, one of Aubrey’s best friends Ansley came over for a highly-anticipated play date. Many weeks ago, Ansley told Aubrey about the movie “Aristocats,” and the girls came up with a plan (all on their own) to watch the movie together for a sleepover. They literally made the plan over dinner, then Aubrey turned to me and said “I’m going over to Ansley’s for a sleepover!! !” Amanda and I convinced the girls that a “naptime” sleepover was just as good as a nighttime sleepover, and we would plan a day soon. Ansley was out of town for Christmas, and all the while Aubrey reminded me of their special plans. So, when Ansley returned, we had lunch and movie date. Amanda and I made kitty-cat sandwiches (which upon seeing the girls joyfully exclaimed “Bunnies!”). They made cat-ear headbands, and created a cozy spot in Aubrey’s room to watch their movie. They wrapped up the play date by putting together a ballerina floor puzzle. It was super fun. I am beyond grateful that my daughter’s best girl friend is the daughter of one of my best girl friends! Wondering what Dan and Thatcher were up to during girl time? They were having guy time. If I hadn’t kept the camera with me for all these occasions, I would happily share pictures of Thatcher sleeping and Dan working out and fixing things. One of my friends recently shared that she and her husband take turns taking their kids out (one-on-one) for “dates” every Wednesday night. I thought that was a really neat idea. Maybe next week, I can take Thatcher to the playground while Dan does a craft project at home with Aubrey, and then we could flip-flop the following week. How do you spend special time with your kids? 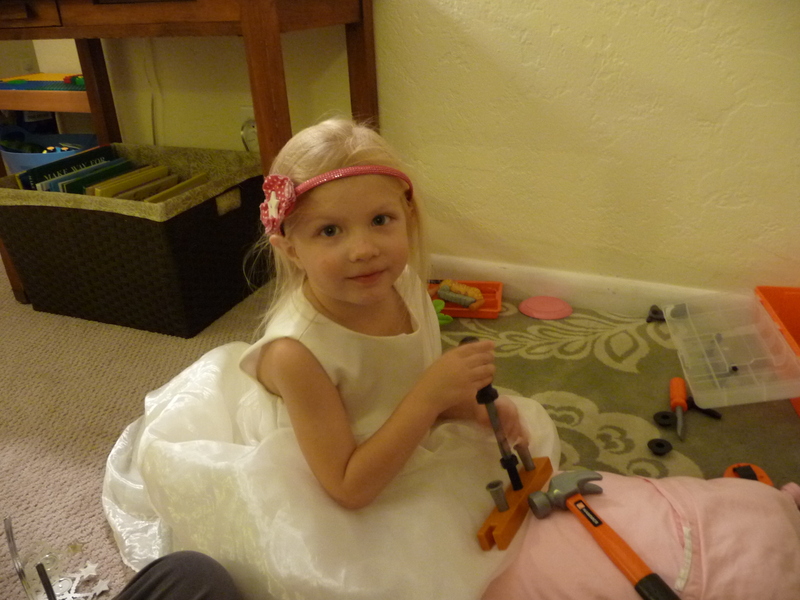 This Princess loves working with tools! I will never forget the most valuable commodity we packed in our suitcases when Dan and I went on a 6 week trip to India for Dan’s work in 2008. It wasn’t long skirts, toiletries, or even our camera… It was peanut butter. Dan and I ate– or at least took a few bites– of every food that was offered to us while we were in India. But even the breakfast food was so spicy that tears would stream down our faces. Our Indian friends and meal-mates at the research center kindly reached for the water pitcher and refilled our glasses. To Indians, spicy food is not only delicious—it also tells a story. Each region of India is known for its particular flavors, and people we met from different areas of India loved to share their food. We had a wonderful time getting to know students, professors, and families in the farming villages. And after each day out in the fields, we returned to our dorm room at the research center, and I savored my peanut-butter-banana-sandwich. When children who are adopted internationally come home to their new country, there is so much transition. Adapting to new language, sights, sounds, smells, expectations, social norms, and even time zones can be exhausting. One of many things we have read about in our adoption training that can help children cope with such a huge adjustment is “comfort food.” What do you think of when you hear “comfort food?” What comes to mind is probably something familiar and warm, that will remind you of a time when you felt safe and loved and cared for. We want our child to have those cozy feelings when he/she comes home. If food is one way we can connect with our child, and help him/her find comfort and familiarity in the midst of everything new, then we commit to learning all we can about the food of our child’s birth country. As we researched the typical diet of people in East Africa, we were reminded of something we learned when we traveled to India—most societies in the world live on just a few staple foods in their diet. The main staple (often a grain or root vegetable) of a society may be part of one meal a day, or part of every meal, or the sole food in the only meal someone eats in a day. We were inspired by the thought of cooking food our child will find comforting. So last fall when Dan and I were brainstorming ways to reduce our grocery budget, we thought “Why not start cooking differently now?” Since October 2013, our family has been eating rice for dinner once a week. During that time, our idea grew… Each time we ate rice, we thought about the people in the world who live on rice. At mealtimes, we began talking with our kids about people who live and eat differently, and how grateful we are for the food we have. This weekly meal is growing into a time of prayer and learning, a time of gratitude, and now a time of sharing. We would like to invite you to come alongside us in our RICE “fast” – to learn more visit our RICE page here. We have had a really lovely Christmas this year. One of Aubrey’s favorite things was pretending to be Mary, and taking care of baby Jesus. She actually has a baby doll whom she named “Baby Jesus” two years ago when she received it as a Christmas gift. This year she especially loved tucking him into bed (I would often walk into Aubrey’s room and hear “the ocean” playing on the sound machine, presumably soothing Baby Jesus in his sleep.). We also went to see Christmas lights, baked cookies, took lots of walks, and went to our friends’ pre-school Christmas programs. Aubrey was thrilled to see one of her best friends Ansley as “Mary” and her cousin Carver as a “Wise Man.” Observing her friends bravely performing on stage gave Aubrey courage for singing Christmas carols at church in the Children’s Choir. On Christmas Eve, our church created an entire “town of Bethlehem” with artisans, live animals, and a nativity. Aubrey and Thatcher loved seeing the donkey, goat, and sheep! I felt especially blessed this year to be able to sit with– practically surrounded by– wonderful friends who also attend our church. What an indescribable blessing it is to feel so at home in the sanctuary. Aubrey pretending to be Mary. She loves to hold baby Jesus! Family walk to see the Christmas Lights! “Wow! Wow!” Thatcher loved the lights! We took a stroll on Christmas Eve. Our church had a whole “Bethlehem” town. Of course, our kids loved the animals! Aubrey’s class sang “Away in a Manger,” “Joy to the World,” and “We Wish You a Merry Christmas.” So sweet! Last year was the first time Dan and I were home for Christmas. I love traditions, but traditional food (Thanksgiving turkey, Christmas ham, all the trimmings) is not my favorite. I was so excited to celebrate Christmas in our own special way, and Dan loves a cooking challenge, so we decided to create new traditions for our family. We planned to have our big “special” meal on Christmas Eve, and just relax with left-overs on Christmas day. I wanted our Christmas Eve dinner to be meaningful, kid-friendly, delicious, and simple enough to allow for lots of quality family time. We got to brainstorming, and ended up wondering what Mary and Joseph would have eaten that first Christmas night. Our research led us to Shepherd’s Pie: root veggies and local meat (usually lamb), grapes, and pine nuts. Perfect! (Lamb did not seem like the fitting choice (per taste and also the symbolism), so we substituted chicken, and call our chicken-pot-pie “Shepherds’s Pie” anyway.) Dan made a seriously delicious pot pie, and the kids and I made pine nut cookies. Everything was really yummy! Half way through our meal I realized I forgot to serve dinner on our Christmas china, and I forgot to put grapes on the plate when I took our picture (at least they made it to the table). But that’s part of the goodness of Christmas, I think. All of our details don’t have to be just right. Of all places Jesus could have been born, it was a stable. I can’t imagine how “not according to plan” that was for Mary, but God came to be with us, right in the midst of our imperfections and forgetfulness, right when we need Him most. Baking cookies together is one of my favorite family traditions! My favorite moments of Christmas this year have been the quiet ones… Reading Song of the Stars with Aubrey and Thatcher by the glow of Christmas lights on Christmas Eve night… Seeing the kids play so contentedly with new toys Christmas morning… Snuggling on the couch with Dan, watching “the fireplace…” I am treasuring these moments of peace, and hoping you are making some really special memories too. Merry Christmas! Playing with her new castle blocks. Exactly 8 months from the day we began our “adoption fast,” praying and seeking God’s direction for our family on the topic of adoption… We mailed in our Home Study and the I-600A to the US Department of Immigration. The “I-600A” is an advance application petitioning the US Government to (someday when we are “matched”) recognize an orphan from another country as a member of our family, and allow us to bring him/her home! Hearing back from US Immigration is also the final step in order to get in the queue with our adoption agency and begin our wait to receive a referral (match) for our child. Here we are!!! So excited! To keep it simple, each evening we will write a note about that day on the family calendar we keep in the kitchen, and take that moment to pray for our child. Then, we will always be able to look back and tell him or her—that’s what we were doing the day you were born. That’s what we prayed for you. And from the very moment you entered the world, you were part of our world, part of our family, in our hearts, in our plans, in our hopes, even in our kitchen. I am really looking forward to Every Day Your Birthday. It will be a New Year’s resolution that I hope will become a favorite family tradition. p.s. Speaking of New Year’s resolutions… get excited for RICE! We will be revealing our year-long commitment January 1st right here (or you can simply scroll up and find the page at the top of this window). We hope you will RICE with us! p.p.s. If you are looking for a special way to capture your daily memories, I saw this beautiful project on one of my favorite blogs! This year, I wanted things to be different. I feel like Aubrey is at this magical age in which she understands and grasps so much, and her imagination and sense of wonder are just bursting out of her– and neither one of these qualities (can I call them “knowledge” and “faith”?) diminishes the other. Essentially, it is the perfect combination for “getting” Christmas. So I set out to actually follow through on my crafty advent plans. My main goal was to create tangible, kid-friendly tools to help my family understand and celebrate Christmas. I also hoped they would be fun & cute! I began by thinking about making an advent calendar like this one. I talked with my crafty friends, and after drawing up a sketch, I realized this might be a bit too ambitious. Thankfully, my sister Val came to the rescue with a very simple and lovely alternative! She even bought all the materials and set up craft time. We started with burlap canvases (pre-made), then laid out a grid with string, and stenciled in numbers 1-25 with red paint. I hot-glued two nails to a “Star of Bethlehem” shaped cookie cutter, and we move the star to whichever day it is (the nails go right through the burlap– easy peasy). I originally thought I wanted an advent calendar with pockets. You can put all kinds of fun things in the pockets– ornaments, gifts, a daily scripture reading, a wintry activity for each day (like ice skating or making a gingerbread house, etc). After some consideration, however, I realized what would happen to a calendar with many pockets: each pocket would be searched each day. Pockets are irresistible to children! If I had a calendar with pockets for each day, I would only put something in the pocket of the “assigned” day anyway, so now that I had the calendar part done, I decided to make one big “pocket” to go along with it. I am not much of a seamstress, so I thought a basic drawstring bag would be the best solution. I already had the linen fabric, and I knew I wanted a star shape on the bag as the counterpart of the calendar. I bought some shiny embroidery floss, and went for it. It was my first embroidery project, and I’m so happy it turned out really looking like a star! All the meanwhile, I was searching for an advent devotional that was relate-able (simple, meaningful, fun) for our young kids. I found a wonderful resource through a sweet friend, and decided to make ornaments that correspond to each day’s theme. I didn’t even realize until I put them together for this picture- but I love that one is a map of following God across the world (“The Way” theme), and the other is a family. Just right for us! I was amazed at how fun it was to paint each one! It was very relaxing, and I found myself doing my own devotions as I worked on each theme. Aubrey and Thatcher have really loved our “Advent Time” so far. Every day, usually after dinner, Dan or I reads a short verse, and then we talk about it in a very simple way. We sometimes do a related activity– I think my favorite so far was pretending to be Mary and Joseph on our way to Bethlehem. As soon as I described the “special activity” Aubrey jumped up and said “I’m Mary! Daddy, you can be Joseph. Mommy, you are the donkey! Thatcher can be the baby donkey.” Aubrey stuffed a doll under her shirt, dumped all her pretend food into her duffle bag, and rode on my back from her bedroom all the way to Bethlehem (aka the living room). Originally, she tried to pack her pot and all her plates in the bag as well, but Dan/Joseph explained it would be a long journey, and we wouldn’t be able to bring everything. Each night after our reading (and activity if we come up with one), Aubrey and Thatcher open up the star bag to find a surprise. As “surprises” we have been giving them elements of the nativity set as they relate to the theme of the day (an angel on the day we talk about the angel bringing the news to Mary, a sheep on the day we talk about the shepherds, etc). And come to think of it, I’m glad I ended up making the star bag, because I don’t think the stable would have fit in one of those calendars with 25 pockets! We have included a few little treats every now and then. This is also where the ornaments come in handy– since we don’t have a nativity piece for each day. To be honest, it’s a bit anti-climactic for Aubrey when she only finds an ornament as the surprise. She was excited to hang the first few on our Christmas tree, and she seemed really impressed with the donkey (“Mommy, how did you get the donkey on here?” “I painted it on.” “But how did you paint it like that?”)… But after the first few days she started telling me “You can do it” when I asked if she wanted to hang the ornament. She’s ready to move on to the next thing (which is most likely whatever Thatcher has already moved on to :)). And that’s okay. I’m happy that our kids are having even a little bit of fun with the things that brought me joy to make! They don’t need to treasure each little moment. I think I may be doing that enough for all of us. And every night when we tuck Aubrey into bed, she asks “What day will it be tomorrow? !” wondering which number the star will move to next on the advent calendar. It is so neat that she gets excited each night– that she is eagerly anticipating the day that is coming, wondering what might be planned, already celebrating what she hopes for… And isn’t that what Christmas is really all about? I have been a bit too busy lately. Part of the busy is the necessary grocery shopping, cleaning, etc. Part of the busy has to do with vital, but less straight-forward tasks like making decisions about Aubrey’s education/school and working on adoption stuff. The last part of the busy is fun stuff that I love to do, but stay up way too late doing (more on that fun stuff in another post soon). When I feel too busy, I try to drop things off my list, but I looked over the list today, and most of it actually needs to get done. I will never rest if I wait until I check off everything on the list. I must discipline myself to rest in Jesus while I “do.” Or take a break from doing, and spend time resting at the feet of the Lord. And really prepare my heart for Advent. Dan and I haven’t missed the coincidence in preparing our adoption paperwork during Advent time. It has been a special time for us, and we feel like we are connecting with Advent in a new way this year. The longing, the anticipation is almost palpable. Dan took this photo right after Thatcher was born. If ever there is a time when the world stops turning, when time of day, and to-do’s mean nothing, it is after a child enters your life. I look at myself here, and I see complete peace. A glimpse of heaven on earth, a gift of the image of God in my arms. What must Mary have felt that night Jesus was born? The very Image of God in her arms? The Gift of salvation for all mankind resting on her chest? The Bible tells us she treasured these moments in her heart. I wonder how often she looked back on those treasured moments as time passed… Did she think on them when she was tending to her children, cooking dinner for her family, and keeping the home in order? Did God gently remind her of the first Christmas when she worried? Surely she clung to those precious memories when Jesus hung on the cross, and her baby boy gave up his life for the world. When I think about preparing for a baby, I think about “nesting.” Getting everything in the home and nursery ready, safe, and cute. The weeks leading up to Thatcher’s due date, I literally wanted to put Dan, Aubrey, and my home on lockdown. No one was leaving until I went to the hospital. A place for everything, and everything in its place. Of course, that wasn’t what happened, but my hormones were telling me that it should. Mary was doing the exact opposite as Jesus’s due date approached. She was leaving everyone and everything familiar. With only what could be carried by a donkey. She put her faith in God, and allowed Joseph to lead her to Bethlehem. My favorite Christmas image is the star. I love that God actually put a star in the sky above Jesus. It is a symbol of searching for, and finding new life. It just occurred to me tonight that Mary didn’t have a star to follow. She wasn’t watching the sky to show her where to go. She was just trusting. And that most wonderful and mysterious night, a star shone in the sky because a baby was cradled in her arms… The Bright and Morning Star.